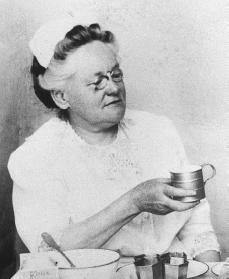 Fannie Merritt Farmer (23 March 1857 - 15 January 1915) was an American culinary expert whose book, The Boston Cooking-School Cookbook, became a widely used culinary text. Fannie Merritt Farmer was born in Boston, Massachusetts to Mary Watson Merritt and John Franklin Farmer. Although she was the oldest of four daughters, born in a family that highly valued education and that expected young Fannie to go to college, she suffered a paralytic stroke at the age of sixteen while attending Medford High School. Fannie could not continue her formal academic education; for several years, she was unable to walk and remained in her parents' care at home. At the age of thirty, Farmer, now walking (but with a substantial limp that never left her), enrolled in the Boston Cooking School at the suggestion of Mrs. Charles Shaw. Farmer trained at the school until 1889 during the height of the domestic science movement, learning what were then considered the most critical elements of the science, including nutrition and diet for the well, convalescent cookery, techniques of cleaning and sanitation, chemical analysis of food, techniques of cooking and baking, and household management. Farmer was considered one of the school's top students. In 1891, she took the position of school principal. Farmer published her most well-known work, The Boston Cooking-School Cookbook, in 1896. A follow-up to an earlier version called Mrs. Lincoln's Boston Cook Book, published by Mary J. Lincoln in 1884, the book under Farmer's direction eventually contained 1,849 recipes, from milk toast to Zigaras à la Russe. Farmer also included essays on housekeeping, cleaning, canning and drying fruits and vegetables, and nutritional information. The book was so popular, so thorough, and so comprehensive that housewives would refer to later editions simply as the "Fannie Farmer cookbook," and it was still available in print over one hundred years later. Farmer provided scientific explanations of the chemical processes that occur in food during cooking, and also helped to standardize the system of measurements used in cooking. Prior to the Cookbook's publication, other recipes frequently called for amounts such as "a piece of butter the size of an egg," or "a teacup of milk." Farmer's systematic discussion of measurement -- "A cupful is measured level . . . A tablespoonful is measured level. A teaspoonful is measured level." -- led to her being named "the mother of level measurements." Farmer left the Boston Cooking School in 1902 and created Mrs. Farmer's School of Cookery. She began by teaching gentleladies and housewives the rudiments of plain and fancy cooking, but her interests eventually led her to develop a complete work of diet and nutrition for the ill, titled Food and Cookery for the Sick and Convalescent. Farmer was invited to lecture at Harvard Medical School and began teaching convalescent diet and nutrition to doctors and nurses. She felt so strongly about the significance of proper food for the sick that she believed she would be remembered chiefly by her work in that field, as opposed to her work in household and fancy cookery. Farmer understood perhaps better than anyone else at the time the value of appearance, taste and presentation of sickroom food to ill and wasted people with poor appetites, and ranked these qualities over cost and nutritional value in importance. Farmer continued to lecture, write, and invent recipes until ten days before her death. To many chefs and good home cooks, her name remains synonymous today with precision, organization, and good food.